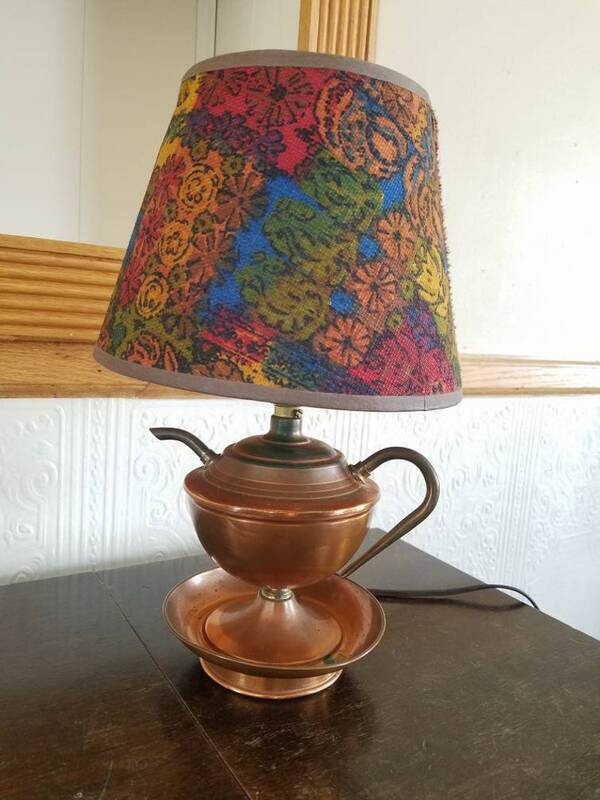 A copper tea pot lamp with original floral tweed lampshade. This is vintage mid century modern table lamp. It comes with the original lampshade which is in good shape, no rips,tears or stains. No smoke smells. It has very light denting at the top. The tea pot has tarnishing but I feel it is part of it's vintage charm. This is a very unique lamp. I have never seen another one like it. It is perfect for your mcm kitchen, farm house or rustic style homes. It is 12 1/2" tall with the lamp shade on. The pot is 5 1/2" tall and the base is 5 1/4" wide.